02 Textiles was invited to exhibit at the 2012 Knitting and Stitching Show in London, Dublin and Harrogate. This is the definitive and best exhibition for lovers of textiles in the UK and Ireland. OTT's stands are: London (TGQ8), Dublin (TGD25) and Harrogate (TG222). 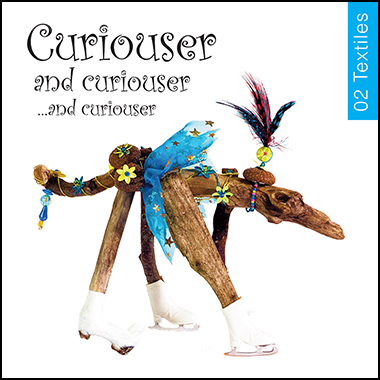 This Autumn sees OTT's first appearance at the show with its exhibition "Curiouser and curiouser ... and curiouser". The exhibition aims to amuse, surprise and intrigue the visitor. Inspiration comes mainly from art and literature, with a dip into the surreal. As is usual at its exhibitions, 02 Textiles' show also features a joint project which highlights each member of the group's different approach to, and understanding of, a common subject. "Curiouser and curiouser ... and curiouser" features "Shelf Life" as its communal project. 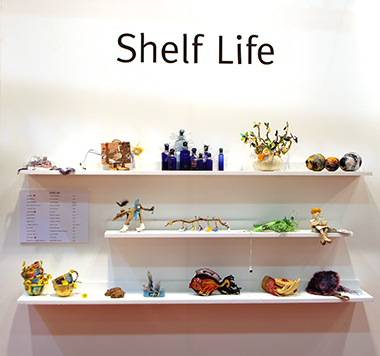 "Shelf Life" consists of a set of shelves on which sits or stands an array of creatures, plants and objects, the likes of which have never been seen before. A diverse range of materials is employed in the making, including silks, cottons, card, metals, papier mache, wire, threads, feathers, beads, and especially, recycled objects. 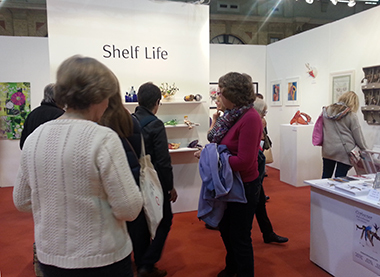 Prepare to be enchanted by the work in the show ... After all, the partcipants have only a limited "shelf life". The Book of the Show - now available! A book has been produced featuring works from the Exhibition by each member of the 02Textiles Group, as well as every piece of "Shelf Life" on show. Not only is this best-selling book for sale on the 02 Textiles stand at the show in London, Dublin and Harrogate, but you can also purchase it from us via this website. The book is for sale at its usual price of £6.00, plus postage and packing (£1.50 in the UK, and £3.00 in the rest of Europe). For more information, just "click" on the image above to create an email enquiry, being sure to provide your email address, name and postal address. Please click on the Photo below to see images of visitors to our stand at the exhbition. 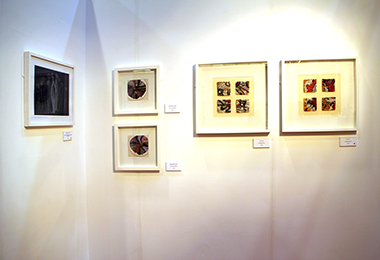 Please click on the Photo below to see images of the main pieces of art work on our stand at the exhbition.